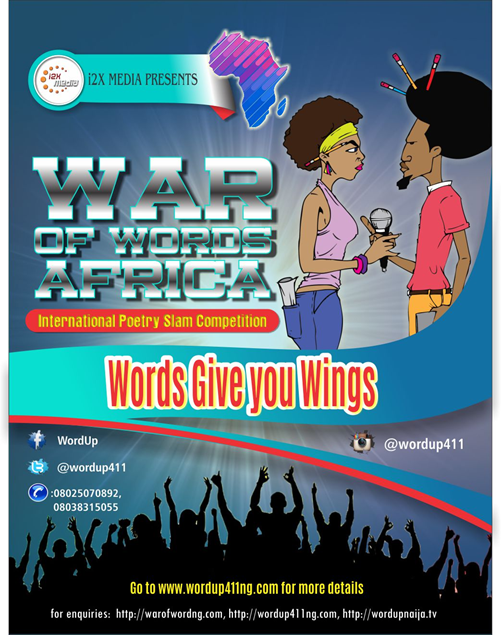 War Of Words Africa #WOWAfrica, the international Poetry Slam Competition for African Poets begins. The Video submission starts from 12am Tuesday March 1 2016 and ends 12am Monday March 28, 2016. The best 60 poets from the video submissions will be selected by in-house judges and invited for auditions. The auditions hold Saturday April 9 and Sunday April 10, 2016. After the auditions 20 finalists will be selected for the main/ final rounds of the Poetry Slam Competition which will hold from April 17, 2016 to May 15, 2016. SPOKEN WORD POETRY IN NIGERIA: The New Revolution in Art?